OSHA and EPA want companies to go beyond fixing immediate cause (which may eliminate a symptom of a problem) and instead, find and fix the root causes of the problems (the systemic/underlying causes). This is especially important for process safety incidents. The fact Sheet explains some of the basic of root cause analysis and suggests several tools for root cause analysis. 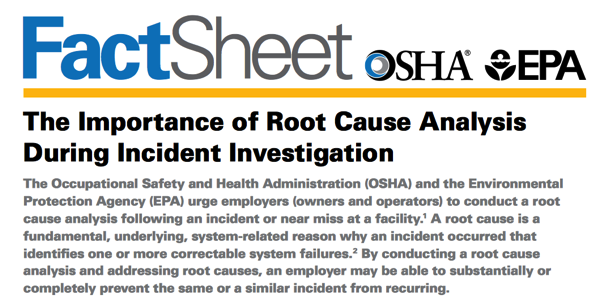 UNFORTUNATELY, many of the tools suggested by the fact sheet are not really suited to finding and fixing the real root causes of process safety incidents. They don’t help the investigator (or the investigative team) go beyond their current knowledge. Thus, the suggested techniques produce the same ineffective investigations that we have all seen before. Would you like to learn more about advanced root cause analysis that will help your investigators learn to go beyond their current investigative methods and beyond their current knowledge to discover the real root causes of equipment reliability and human performance related incidents? These are techniques that have been proven to be effective by leading companies around the world.